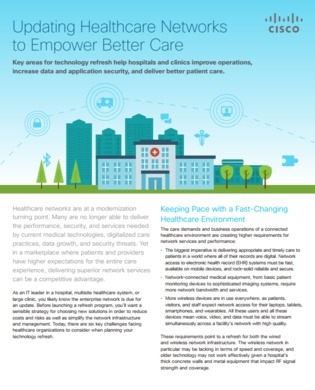 The care demands and business operations of a connected healthcare environment are creating higher network services and performance requirements. These new requirements point to the necessary refresh for both the wired and wireless network infrastructure for many hospital systems, but even other systems such has security and communication systems will need updating. In this white paper, explore key areas for technology updates and refreshes that healthcare organizations should be looking into.